A company can make great strides using Automated Testing. The important benefits include, higher test coverage levels, greater reliability, shorted test cycles, ability to do multi user testing at no extra cost, the setting up of test pre-conditions and other test control and test reporting functions, all resulting in increased levels of confidence in the software and successful deployment. We will try to understand few important aspects with Automated Testing. This document will help you understand what Automated Testing means, why its required and how to implement it using AppPerfect. Automated Testing is use of software program to control execution of testing tasks automatically. Automated Testing involves automating manual testing tasks which are mostly time consuming and error prone. Automated Testing is a more accurate, efficient, reliable and cost effective solution to manual testing. Automated Testing involves carrying set of tasks automatically and comparing the result of same with the expected output and ability to repeat same set of tasks multiple times with different data input and same level of accuracy. It also involves setting up of test conditions, test control and test reporting functions. Automated Testing is a solution to all the issues raised with Manual testing. An Automated Testing tool can playback all the recorded set of tasks, compare the results of execution with the expected behavior and report success or failure to the test engineers. Once the automated tests are created they can easily be repeated for multiple number of times with different data sets and can be extended to cover additional features at a later time. Most of the software organizations consider Automated Testing as critical to their testing process and there are many things which should be considered before selecting an Automated Testing tool. A company can make great strides using Automated Testing. The important benefits include, higher test coverage levels, greater reliability, shorted test cycles, ability to do multi user testing at no extra cost, all resulting in increased levels of confidence in the software. Automated Testing can Run Unattended : With Automated Testing you can run complex and lengthy tests unattended. Test can be scheduled to run overnight and engineers can analyze the results of execution next morning. As a result you save time and improve efficiency and can concentrate on other important tasks while scheduled tests run in background. Automated Testing provides High Test Coverage : Automated Testing increases the scope of test cases to help improve software quality. Automated Testing can validate and monitor things which is not possible to do manually. It can monitor the machine resources and internal program states to determine if the software is running as expected. Automated tests can easily run hundreds of complex test cases during every test run providing coverage that is impossible with manual tests. Resources freed from repetitive manual tests can utilize the time in creating new automated tests to deal with new features in the application. Automated Testing can be distributed over multiple machines : Automated Testing allows you to distribute your tests among multiple workstations to simulate real-world conditions while testing web or intranet sites, client-server and other multi-tier applications. Testers can easily manage the list of workstations, specify which automated tests to be run on each workstation and synchronize the automated test execution. 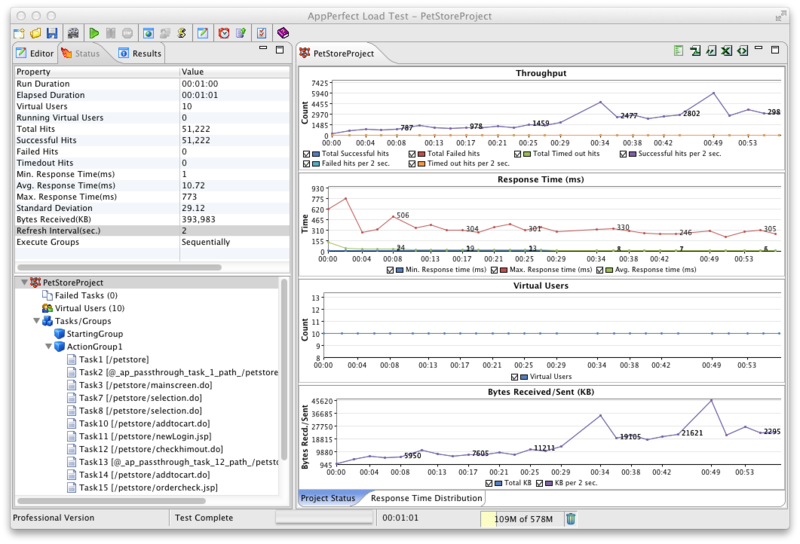 Automated test results from all workstations are accumulated into a single report for easier analysis. Automated Testing with Virtual users simulation : In real world your web applications/services will be accessed online by thousands of users simultaneously. More often applications tested manually are found to be working fine as they only cover single user scenario, but when deployed and accessed by multiple users simultaneously they can fail to perform. Automated Testing can simulate multi user environment using threading model where multiple virtual users can be executed to perform same tasks simultaneously. So you can test all the possible scenarios due to multi-user access before going live. Something which is impossible with Manual testing. Automated Testing is Cost Effective, Reliable and Efficient: Its practically impossible for a human tester to repetitively cover all the test cases with same amount of accuracy over and over again. Automated Testing's ability to perform complex set of tasks repetitively with same amount of accuracy every time makes it both cost effective and reliable solution for testing. Automated Testing on different hardware configuration : Automated Testing is platform independent. Automated Tests recorded on one platform can be used to played back over different operating systems and hardware configuration. Automated Testing and Team Sharing : Test Engineers can share the automated test scripts and results with different members in the team. Automated Scripts can be shared with developers which they can use to run after every source change to check for any regression. Functional Testing : All applications are designed and developed to meet and satisfy certain functional needs. A functional need may be technical, business, or process based. Functional Testing is the process by which expected behavior of an application can be tested. Functional testing is use of software program to detect if your web application is functionally correct. Functional testing of web applications involves testing of front-end or user interface of your web applications running in web browser. Functional testing includes automating manual testing tasks which are mostly time consuming and error prone. Functional testing is a more accurate, efficient, reliable and cost effective solution to manual testing. Functional testing involves carrying set of tasks automatically and comparing the result of same with the expected output and ability to repeat same set of tasks multiple times with different data input and same level of accuracy. Load Testing : Load Testing of web applications involves testing the performance and scalability of your web application on server side with varying user load. 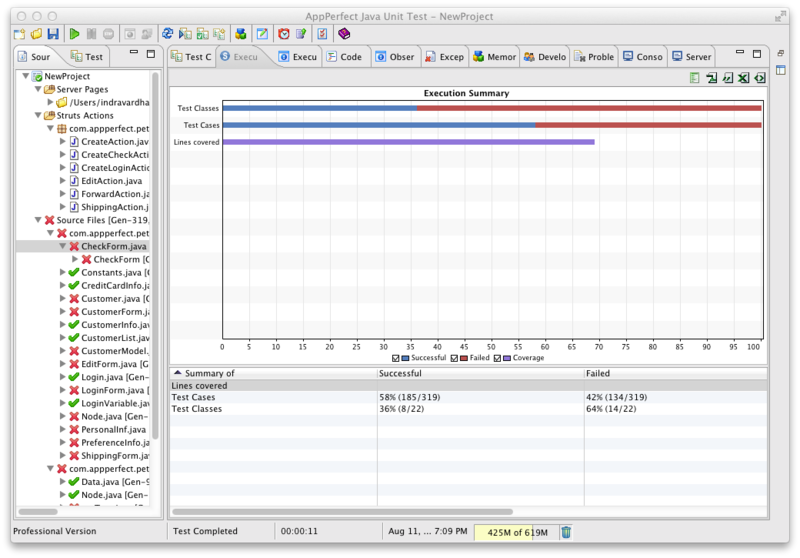 Load testing involves simulating real-life user load for the target web application. It helps you determine how your web application behaves when multiple users hits it simultaneously. Load testing with different load strategies and conditions helps you determine software design issues like incorrect concurrency/pooling mechanism, poor optimization, memory build-up, etc. Load Testing helps you identify server configuration issues with Web server, application server, database server, load balancer, etc. Load Testing helps you detect if your current infrastructure is sufficient to meet your user demand. Load Testing helps you determine the peak user load your application can sustain, number of concurrent users your application can support, and whether or not your application will scale as more users access it. GUI Testing : GUI testing or user interface testing includes functional testing of desktop application including Windows applications, Java applications, .NET or any other GUI applications. UI testing is use of software program to detect if your windows application is functionally correct. UI testing of windows applications involves testing of front-end or user interface of your windows desktop applications. UI testing includes automating manual testing tasks which are mostly time consuming and error prone. UI testing is a more accurate, efficient, reliable and cost effective solution to manual testing. UI testing involves carrying set of tasks automatically and comparing the result of same with the expected output and ability to repeat same set of tasks multiple times with different data input and same level of accuracy. 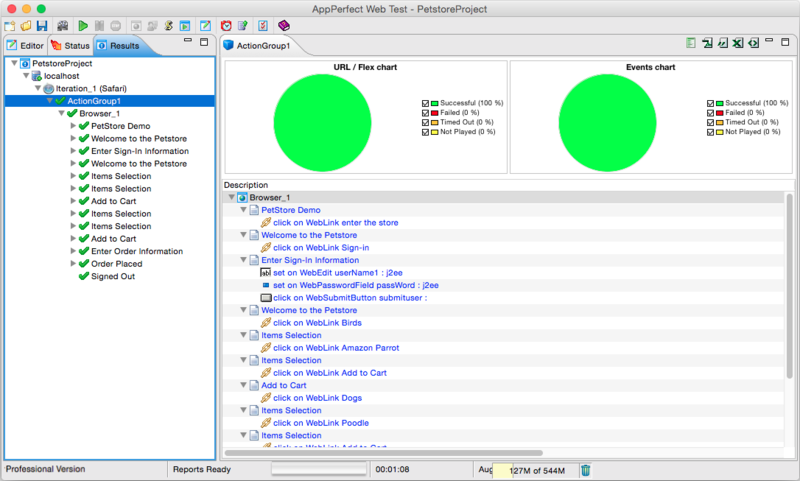 UI testing of windows/java desktop applications can be implemented using AppPerfect App Test. 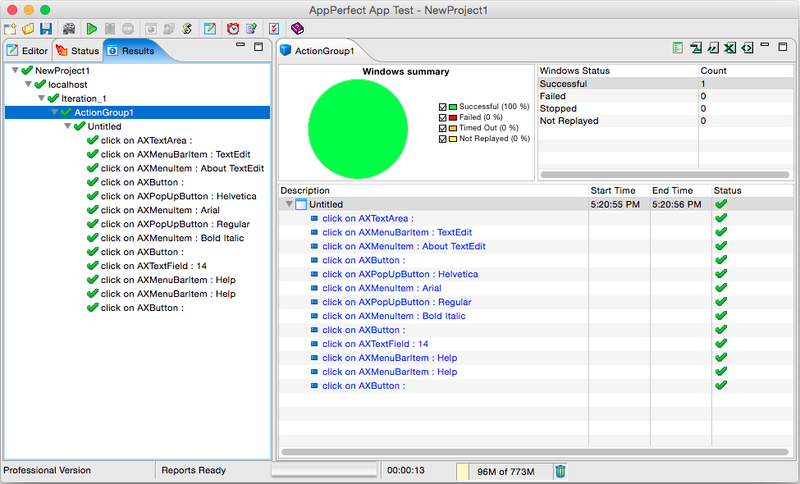 AppPerfect App Test provides accurate recording and replay of Windows GUI events. It records all the activities you perform in your Windows or GUI desktop application and then plays those activities automatically. It is easy to use with no programming needed. Implementing functional UI tests for your application early in the software development cycle speeds developments, improves quality and reduces risks towards the end of the cycle. 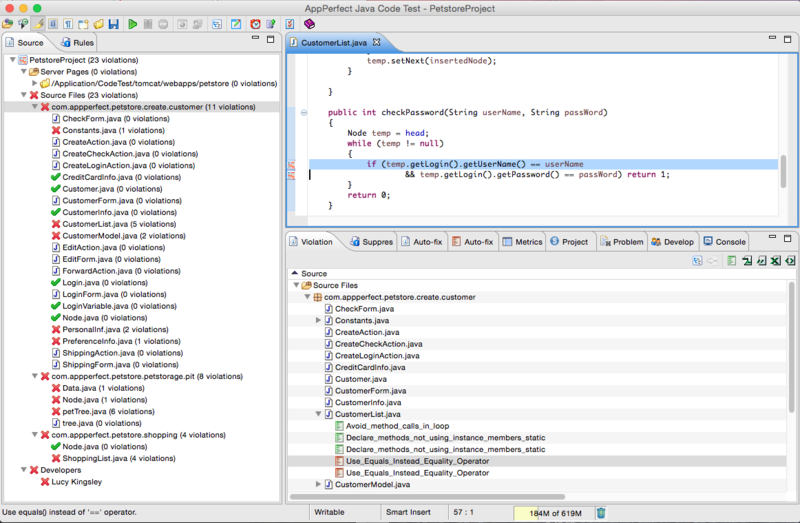 Automated Code testing of java source can be implemented using AppPerfect Java Code Test. AppPerfect Java Code Test offers you a variety of options to test and optimize your application and make it free of bugs and problems. AppPerfect Java Code Test is a static Java code analysis software designed to perform the two key tasks: Automate Java Code review and Enforce Good Java Coding Practices. AppPerfect Java Code Test can analyze your Java and Java Server Pages (JSP) source code and implements over 750 Java coding rules to check your code for consistency, portability, stability, optimization and coding standards. Agentless Monitoring : Agentless Monitoring is a new generation of monitoring systems that do not depend on the traditional/legacy agents-based approach to monitoring. Agentless monitoring depends on existing services available on the remote monitored device. Agentless monitoring is capable of monitoring a wide range of devices and applications including operating systems, Java/J2EE application servers, databases, Web servers and any device with an SNMP agents such as routers. 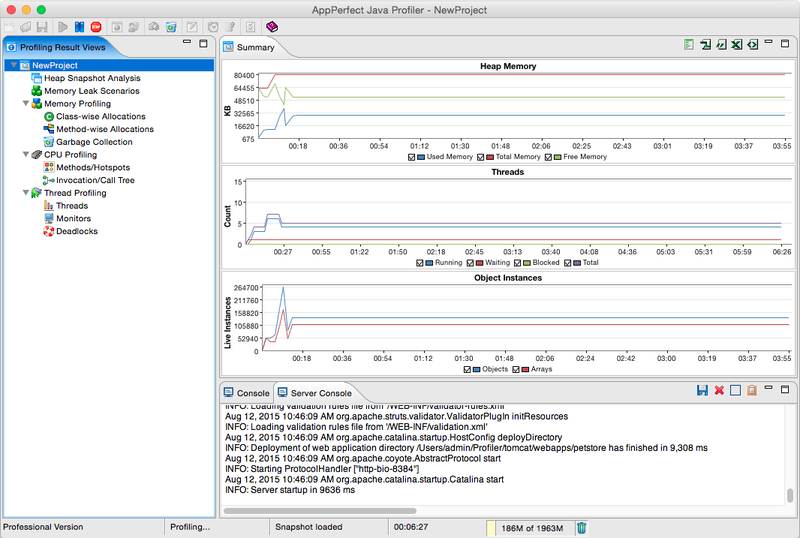 Agentless Monitoring can be implemented using AppPerfect Agentless Monitor. Unlike most other monitoring systems which require heavy downloads, massive installation / configuration and client-side software, AppPerfect Agentless Monitor is a 100% server-based software which can be accessed from anywhere via a Web browser. Furthermore, with AppPerfect Agentless Monitor, there is no need for intrusive and expensive agents to be installed on the monitored devices. AppPerfect Agentless Monitor will use existing services available on the device to remotely monitor the device. At the heart of AppPerfect Agentless Monitor is a sophisticated rules engine capable of sensing rule violations within seconds and alerting you immediately. The notification server included with the AppPerfect Agentless Monitor is capable of communicating such alerts via its Dashboard UI, email, SMS, a HTML report or any custom notification mechanism you prefer.